You may know a lot about of things about sleeping in a hammock, for example what the best sleeping position is, how to keep yourself warm…However, you need to start with a hammock that fits you and makes you feel comfortable; or else all other things you know may not be helpful for a peaceful night of sleep at all. Based on your height and weight as well as the weather conditions of the camping location, bring the bright hammock with you. If you are tall and prefer lots of space, a double hammock should suit you well. In case you tend to feel constrictive with sleeping in a symmetrical hammock, opt for an asymmetrical hammock so that you can sleep more comfortably. Please stay away from nylon strap because they will most likely stretch over the night and make your hammock sag more than necessary. If you want the hammock to remain like how it is throughout the night, choose polyester or polypropylene webbing instead. And make sure you choose strong anchor points that can withstand the weight. When you choose a hammock over a tent, you should understand there is no way you can sleep in it like a bed. You should expect lots of curve instead, so remember not to hang it to tight or stretch it as flat as you can. The trick for sleeping comfortably in a hammock is to hang the strap at around 30°. At this angle, your hammock is hung stably, creating a flat platform for you to sleep diagonally, which is, in fact, the idea way to sleep. Your feet should be slightly higher than your head as you sleep. This is a mistake that beginners often make. If your hammock is hung high above the ground, it will be hard for you when you need to get things on the ground. Plus, it takes longer to get in and out of the hammock. 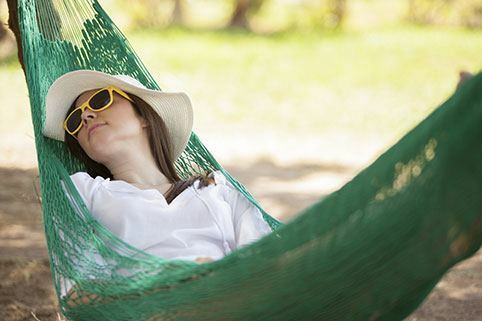 Sleeping in a hammock means your body is suspended in the air. You can get cold easier, which is most evident in cold winter months. That is why you need appropriate accessories to stay warm throughout the night and have a peaceful sleep. It is advised that you get a mummy-shaped sleeping bag rather than a rectangular on because it will fit well into a hammock. It is easy to fold as well. In cold months, you should choose a warmer sleeping bag because it can be much colder sleeping above the ground. To fight off the cold better, you can also use a camping pad underneath the sleeping bag. For extra protection against the cold, you should use underquilts which surround th outside of the hammock. In case you don’t have one, an emergency blanket can be a good substitute, provided that it is waterproof. In normal weather conditions, a thin blanket can do the job well enough. Other things you may need are extra socks and a hot water bottle. Of course, it is obvious that you should a good location where the wind doesn’t blow too hard. Whether the weather is cold or not, having a pillow can help you sleep in a hammock much better. Having that soft extra layer between your head and the cold, tough inside layer can keep you warmer and more comfortable. These flying creatures can be really bothersome your trip: they can bite you and generate noises that disrupt the sleep of light sleeper. You will find a bug net in almost all hammocks available in the market so make sure you use it. If your hammock doesn’t come with a bug net, grab one immediately. A tarp can come in handy in various situations. In cold summer month, it can trap heat around your body to keep you warm. Don’t go camping without one: It can shield off snow, wind, rain and scorching sunlight very effectively. You don’t necessarily need an expensive tarp: even a basic8×10 tarp can do the tricks. For maximum protection against weather element, you should choose a full-coverage tarp. Those with extra tie-outs allow you to pitch them in various style or shapes. As you can see, most of the tips for sleeping well with a hammock are very simple but effective. Do you have any other tips to share with us?